Experience our exclusive benefits in one of our luxurious suites. At Intown Luxury House we believe that your comfort and enjoyment for shopping are of paramount importance to your stay. 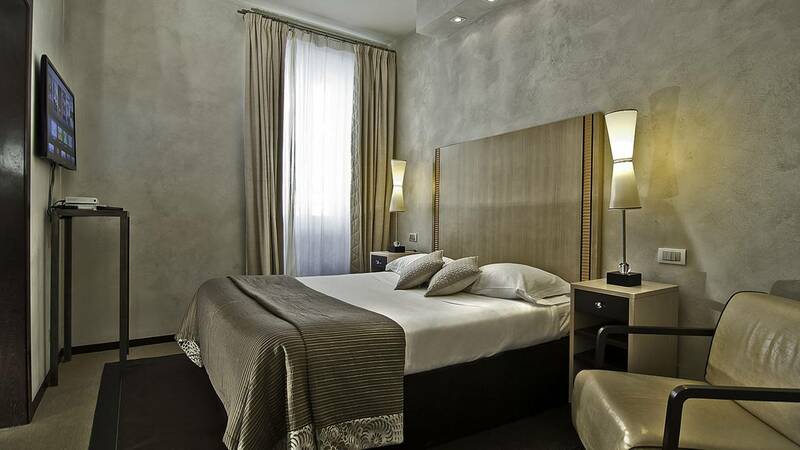 With this in mind we have upgraded our suite offerings to reflect the magnificence of Rome. The name INTOWN was born to reproduce the scenographic element of the city whereas Luxury House reflects the possibility of dwelling in a sumptuous place, where each and every detail is characterized by high quality design and artistic minimalism. At times, visual wellbeing is a tangible value. Each suite is characterized by a particular style, but considered as a whole they are a sole expression. The architecture and decor have a distinctive "Modern" touch, looking back to Thirties but reinterpreted in a minimalist key, thus with an abundance of wood, from zebrano to wengue, the opulence of crocodile and the rustling of silk. Every single detail, from furniture to the shaped profiles of each fitting, from door knobs to lit objects, has been expressly designed independently of a preset project grid, thus resulting in a rigorous yet decontracté outcome. Different inspirations blend in an atmosphere of total naturalness: paintings by Sir Alma-Tadema, quotes from the Forties and Fifties with Savinio images, Japanese influences with pre-Columbian touches, all accompanied by uncommon plants. A highly calibrated exercise of style for offering a sophisticated "house" feeling, in a wonderful location...near Spanish Steps. Complimentary use of phone for all local calls and complimentary local calls from your suite. Air Conditioning, Extra Long Beds (> 2 metres), Heating, Hot Tub, Private Entrance, Safety Deposit Box, Seating Area, Sofa, Sofa Bed, Soundproofing Tiled / Marble floor Wooden / Parquet floor, Work Desk, Bath or Shower, Bathrobe, Bathroom, Bathroom Amenities, Guest Toilet, Hairdryer Slippers, Spa Bath Toilet, CD Player, DVD Player, LCD /Plasma /Flat-screen TV Pay, TV, Radio, Satellite TV SKY, Telephone, Dining Area, Minibar, Wake Up Service/Alarm Clock. 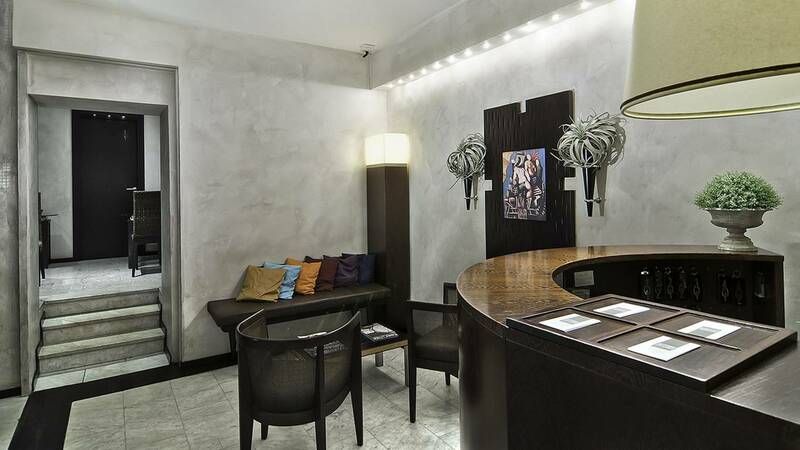 Bar, 24-Hour Front Desk, Newspapers, Terrace, Non-Smoking Rooms, Elevator, Express Check-In/Check-Out, Safety Deposit Box, Soundproofed Rooms, Heating, Design Hotel, Luggage Storage, Allergy-Free Room Available, All Public and Private spaces non-smoking, Air Conditioning. Free! Wired internet is available in the hotel rooms and is free of charge. Free! Wi-fi is available in the hotel rooms and is free of charge. American Express, Visa, Euro/Mastercard, Carte Bleue, Maestro, CartaSi The hotel reserves the right to pre-authorise credit cards prior to arrival. Cancelations up to 5 days from check-in are free. In case of cancelation or no-show the price for the entire stay will be charged.